Each service increases a home’s comfort, convenience, security and accessibility. Our job is to extend independent living at home while preparing residents for temporary or permanent homecare and in-home assisted living where necessary. Our projects increase the length of time people can live at home with a high quality of life and they keep older adults from moving to higher, more costly levels of care prematurely. Examples of our projects shown here reflect our clients’ unique homes, requests, needs, circumstances, ideas and preferences – yours will be different. Lifespan Home Modifications offers several services for people building a home for retirement or for multi-generation families that include older adults. Basic plan reviews begin with a client’s ideas and concept or by having us look at anything from rough sketches to architectural drawings or construction documents. We examine all of the details from site preparation, excavation, foundation, floor plan, roof design and landscaping to make sure that a new Universally Designed home meets the criteria for Aging-In-Place. This thorough planning process anticipates the future by eliminating the need for costly remodeling as the needs of people living in the home change over time. It also reduces the chance that family members will need to move if home health care becomes necessary. 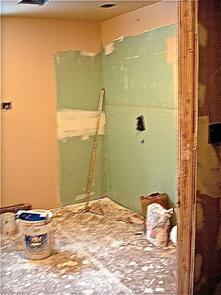 Occasionally, clients ask us to manage their new home construction project for them. This involves getting estimates from homebuilding contractors, advising our clients on contractor and subcontractor selections and ultimately overall project supervision. We represent our clients’ interests and goals as we work alongside licensed contractors and their subs to make sure that all work is completed as specified. Good planning also includes building material and product specifications including detailed installation instructions. Because Universal Design makes the home universally useable by people of all ages and abilities, our specifications and installations differ slightly from conventional construction. The example below details ways that Universal Design for new home construction is different than traditional homebuilding. This new Universal Design home project eliminates the need for steps or stairs at the entrance. To achieve this, the foundation design, site slope and door all need to work together. In addition to avoiding front steps, the wider door includes a level threshold, which eliminates a tripping hazard and allows easy access for wheeled mobility devices. The door sidelight windows provide excellent security sightlines for seeing visitors at the door from inside. 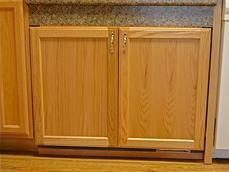 It also includes a levered handle that is easier than a doorknob for older hands to operate. The keyless lock has large contrasting numbers that are backlit so older eyes can see them better in low light. The roof overhang protects a textured, slip-resistant walkway between the driveway and the door so the entire entrance is free of ice and snow in winter without shoveling. Each of these construction details complements the others to create a Universally Design entrance. If just one detail is missing or installed incorrectly, it often decreases access and does not meet the standard. Our job is to make sure that all of the details work together for the best possible results. Solutions: Provided design services and contractor bid specification packet for construction of new 3 bedroom, 2 bathroom Universally Design home. Assisted with contractor interviews and final selection. 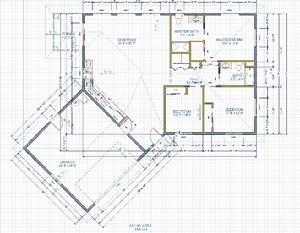 Advised homeowner and contractor on construction details and specifications as project progressed. Recommended additional modifications for improved functionality and accessibility after occupancy. Sometimes the most cost-effective way to Age-In-Place is to purchase an existing home in a community or neighborhood of your choice. For some people, it is a much better alternative than modifying their current home. This is especially true for people living in split-level homes or homes with sunken living rooms or many flights of stairs. Clients who are considering a potential home purchase often ask us to evaluate a home to determine if it will support their needs over their lifetime. We provide a home purchase analysis that includes an inspection of the home and an evaluation of key features for accessibility and adaptability. We also work with clients to define and prioritize the work that needs to be done and to get cost estimates from remodeling contractors or handyman services. Remodeling essential rooms or areas of a home or constructing an addition like an in-law apartment makes a lot of sense for people interested in Aging-In-Place. It keeps them in their own familiar home and neighborhood while providing housing that anticipates future changes in their healthcare and safety needs. 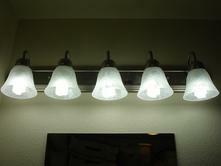 Most people are familiar with remodeling or renovations that would improve their homes now. But few people are aware of the needs that their future, older selves might have. While we do not have a crystal ball to predict the future, our experience shows that incorporating requirements for all ages and abilities (the definition of Universal Design) increases the odds that people will remain living at home longer than would otherwise be possible. We incorporate details that improve ergonomics, vision, mobility and safety for the majority of older adults and for potential caregivers in the home. This approach helps clients avoid the single most expensive mistake people often make – starting a Do-It-Yourself project or having contractors bid on a job without considering future needs as well as current ones. We begin by meeting with clients to learn about the strengths and weaknesses of their current living environment and to learn about any physical or cognitive considerations to be included in the remodeling or renovation project. Then we evaluate each area of the home for barriers, challenges and obstacles that need to be corrected. Priorities usually include improving access into and through the home and providing at least one accessible bathroom-bedroom suite on the main or first floor. Once a scope of work is determined, we can work on some or all aspects of the project from planning and design, to specifications and cost estimating, to contractor selection and project management. Goal: Eliminate the need for an older adult to climb over the bathtub rim to shower, reduce risk of falling, remove slippery flooring surfaces and increase overall bathroom safety for independent or assisted dressing, bathing, toileting, grooming, mobility and transferring. 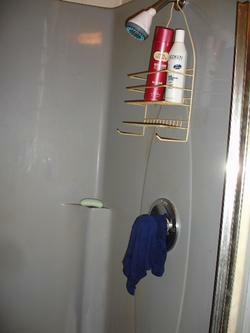 Solutions: Bathroom safety remodel included an open, European-style shower with no raised threshold to reduce the chance of falls and to provide easy access for a rolling shower chair and to make assisted showering possible. 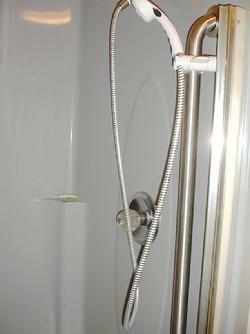 The curbless shower includes a one-piece, engineered, pre-sloped shower pan to ensure good drainage to the floor drain. Textured, slip-resistant, wetroom sheet flooring covers the entire bathroom floor and shower to provide a safer, lower maintenance alternative to tile. 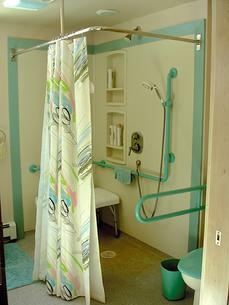 Other shower features include colorful, clearly visible grab bars; two showerheads (fixed and height- adjustable) for maximum flexibility; single-lever water control for easy operation; anti-scald valve and two recessed storage alcoves to keep shower accessories within easy reach for both seated and standing showering. 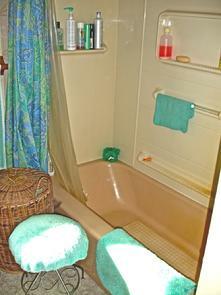 Additional bathroom safety features of the remodel included improved task lighting at sink, toilet and shower; higher toilet with a drop-down grab bar on one side and horizontal grab bar on the other; a sitting sink with discrete retractable doors covering the footwell; increased accessible storage for toiletries, linens and bathroom supplies. 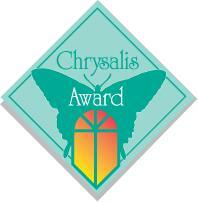 Follow the link below for details on this 2014 Residential Universal Design Chrysalis Award-winning project. Small modifications to a home can make life easier and safer for older adults to remain at home and live independently. 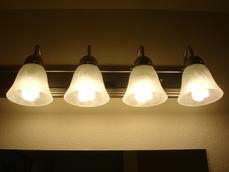 We offer home accessibility audits that are similar to home energy audits. But rather than looking at heating systems and insulation, we look at the energy it takes a person to go through each activity of daily living. These activities include eating, dressing, bathing, toileting, grooming, ambulating and transferring from one position to another. The audit focuses on how safe and easy it is to get in and out of the house, to use the kitchen and bathroom and to access other areas of a home that are essential to a person’s quality of life. We often follow up by completing work on improvements that clients feel are high priorities for their living circumstances and budget. The examples below demonstrate some of our projects where modifying clients’ homes made it easier for them to Age-In-Place. Goal: Improve flexibility for seated or standing showering, reduce risk of falling, increase safety for independent bather and facilitate caregiver assistance. Solutions: Converted a standard fixed-height showerhead to a height-adjustable style that adapts for people of different heights and for seated or standing showering. 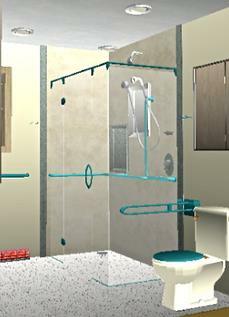 Grab bar location offset toward the shower entry door places the bar within easy reach to make entering and exiting the shower safer. On / off / pause button on showerhead improves water control for seated independent bathing and it allows caregiver to assist showering without getting wet. 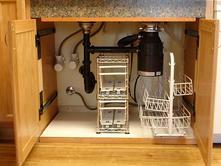 Solutions: Installed roll-out wire storage system with adjustable, removable organizer baskets. Covered under sink opening with sliding retractable doors that match existing cabinetry and slide into opening under sink to prevent door damage and increase access. 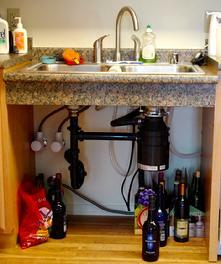 Improved and increased storage while keeping potential for seated sink use and access with mobility equipment. Sorting through all of the building product options and installation alternatives can be daunting for many homeowners. Selecting plumbing and lighting fixtures, cabinetry, countertops, flooring, windows, doors, hardware, furnishings and appliances is only part of the process. We often see expensive products so poorly installed that they create, rather than alleviate, safety hazards. At the other end of the spectrum, we routinely specify many inexpensive, readily available building products for our jobs. However, these usually require installation techniques different from conventional methods to make them more accessible, durable and low-maintenance. We keep up to date with new building products, installation techniques and design concepts that add value to our clients’ projects and ensure the best results at the best possible price. That makes it easy for us to guide customers through the maze of choices and identify only the most appropriate building products and materials for Universal Design and Aging-In-Place projects. Our customers then make final decisions that reflect their own budget, preferences and needs. We work with our customers and others working on their project to make sure that everyone understands the required installation techniques for the results that customers, and we, expect. 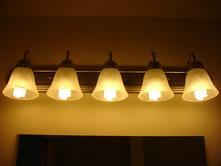 Solutions: Replaced original 60-watt incandescent light bulbs with compact fluorescent bulbs that operate at a cost saving of 80% and provided residents with Correlated Color Temperature lighting options. Most residents selected bulbs with a CCT of 3500 Kelvin or higher.